Today, the V&A announces Maqdala 1868: a free display of around twenty stunning Ethiopian objects, which will open on 5 April 2018. It commemorates the 150th anniversary of the siege and battle at Maqdala, the culmination of the British Expedition to Abyssinia. Spanning several V&A collections including metalwork, photography and textiles, the display will showcase outstanding examples of Ethiopian metalwork and craftsmanship within the context of the collection’s complex history. Maqdala 1868 will focus on the run-up to the battle and its aftermath, including some of the earliest examples of military photography in Britain, the precursor to modern photojournalism. 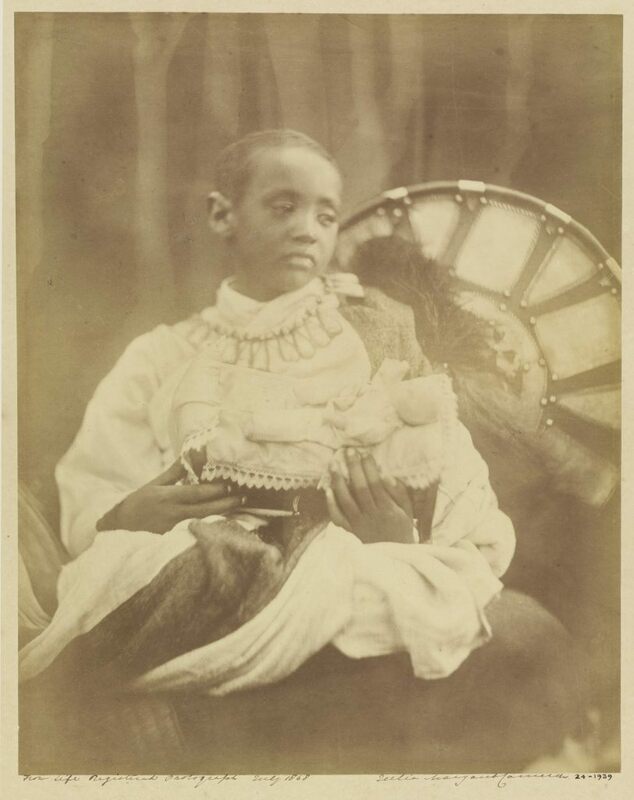 Also on display will be a portrait of Emperor Tewodros II’s son Prince Alemayehu, taken by Julia Margaret Cameron soon after he was brought to England by the British military. Examples of intricate and skilled Ethiopian metalwork and textiles will also be shown. 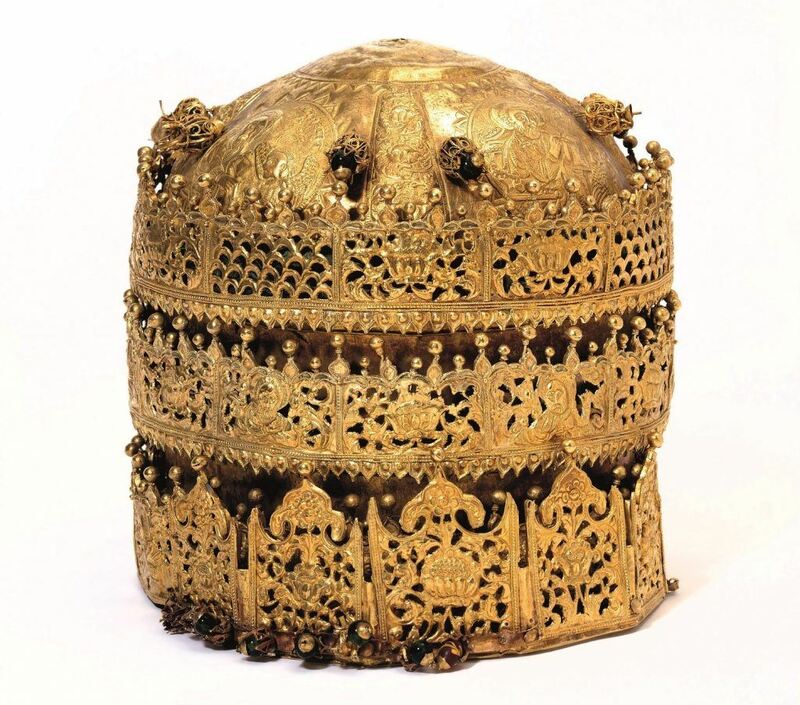 Highlights include a gold crown, admired for its filigree designs and embossed images of the Evangelists and Apostles, a solid gold chalice, a selection of jewellery and a wedding dress thought to have belonged to the Emperor’s wife, Queen Terunesh. The objects in this collection were taken during a British military expedition, led by Sir Robert Napier from 1867-8 to secure the release of British hostages imprisoned by Ethiopian Emperor Tewodros II. On 13th April 1868 the campaign culminated in the death by suicide of the emperor and the destruction of his fortress. Four years later, in 1872, Her Majesty’s Treasury deposited a gold crown and chalice at the V&A. The rest of the V&A’s collection relating to Maqdala came to the V&A at a later date via private donations, bequests and purchases. Maqdala 1868 has been organised in consultation with the Ethiopian embassy in London and an advisory group from the Ethiopian community and historians, members of the Orthodox Tewahedo Church, members of the Anglo-Ethiopian society and representatives from the Rastafarian community. Quotes from key contemporary Ethiopian and British sources will form an important part of the interpretation of the display, including excerpts from former Prime Minister William Gladstone’s speech to the House of Commons in 1872 on the question of ownership. The display will be complemented by a programme of related events and online resources on the V&A website to explore in more depth the design context and histories of the collection. Magdala 1868 will run from 5 April 2018 – July 2019, in the Silver Galleries, Room 66. Admission is free. Her Excellency, Dr Hirut Woldemariam, Ethiopia’s Minister of Culture and Tourism and the Ethiopian Ambassador to the UK, Dr Hailemichael Aberra Afework, will attend the opening reception at the V&A on 5 April 2018. 2018 also marks the 200th anniversary of the birth of Emperor Tewodros. The V&A has collected objects from Africa since the Museum’s inception, including important historic artefacts from Egypt, Ghana and Ethiopia, ceramics, textiles and glassware from North Africa, and prints and photographs from South Africa. Many of these objects are on permanent display in a number of galleries throughout the Museum. The V&A’s collection of art and design from Africa have also been the subject of a number of temporary exhibitions and displays in recent years, such as In Black and White: Prints from Africa and the Diaspora (29 November 2014 – 6 July 2015), V&A Africa: Exploring Hidden Histories (15 November 2012 – 3 February 2013), and Figures and Fictions: Contemporary South African Photography (April – July 2011). The collections of the Victoria and Albert Museum include a number of Ethiopian objects and images. Many of these are associated with a British military expedition undertaken to Ethiopia (then known as Abyssinia) in 1867-68. Not all of the objects, however, are straightforward products of plunder. Indeed, the stories behind the acquisition of the photographs, textiles, jewellery, religious and other artefacts held by the V&A reveal a complex web of people, places and politics brought together by conflict. This article presents the stories which lie behind some of these objects and contrasts the personal experiences of those caught up in the conflict with the way in which the 'Abyssinian Expedition' was presented to the British public.